Cycling is a great way for kids to get exercise and learn how to care for their bicycles. There are several ways for kids stay safe while bike riding and keep their bikes in excellent condition. 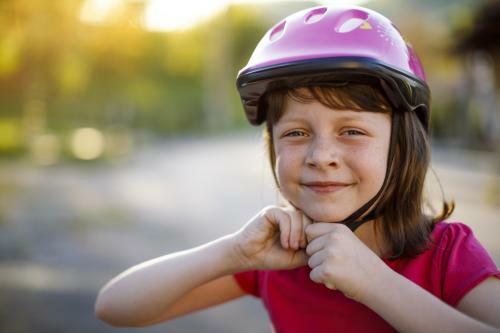 A helmet can protect your child's head during an accident and in many cases prevent serous injuries and death. Finding a proper fitting helmet can be tricky and may take some patience. Helmets should fit snuggly, cover all areas of the head and stay in place while the child is moving. Annually, of the 515,000 bicyclists who endure some sort of injury, an estimated 26,000 of them are children or adolescents who end up with traumatic brain injuries. A study conducted in 2012 revealed that only about half of children who ride bikes actually wear helmets despite state laws and injury prevention. Even if your child is just pedaling around the cul-de-sac or off-road in a local park, helmets are necessary. Razor makes a highly-rated helmet for children five to eight or with heads sized 21.5 inches to 22 inches. It costs around $11 and comes in black, yellow, purple, pink and blue. Obsidian Cycling makes a helmet that comes in small, medium and large sizes fitting heads from 54cm to 62 cm. This helmet works for adolescents and costs around $63. Over time, bike brakes wear down and work less effectively. Before your child gets on his bike, perform a visual inspection of the brakes to make sure all the components are there. There should be a brake pad that makes contact with the disc brakes when the handle bar levers are squeezed. If everything looks okay, have your child walk their bike and squeeze the brake levers to make sure they are working with wheel movement. If brakes are less responsive than usual, take your child's bike to get adjusted and inspected by a professional. Each time before your child rides a bike, check her tires. Tires should feel firm and not have any holes in them that allow air to escape. Listen for a hissing sound as your child walks her bike. This indicates a hole or slit in the tire that needs to be patched or replaced before riding. If there are no holes, but the tires feel flat, use a pump to add some air into the tires until they are firm again. Have your child test ride the bike to make sure the air pressure feels good when they are going straight as well as making turns. 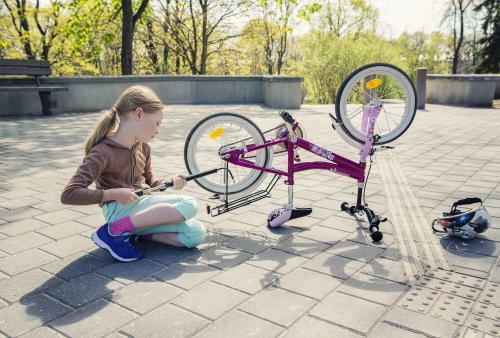 Riding a bike with flat tires is bad for the bike and puts your child more at risk for falling. If you have an older child who will be bike riding with friends or alone, have her carry a patch kit just in case. Riding a bike with a properly fitted seat allows for a smoother, safer ride. 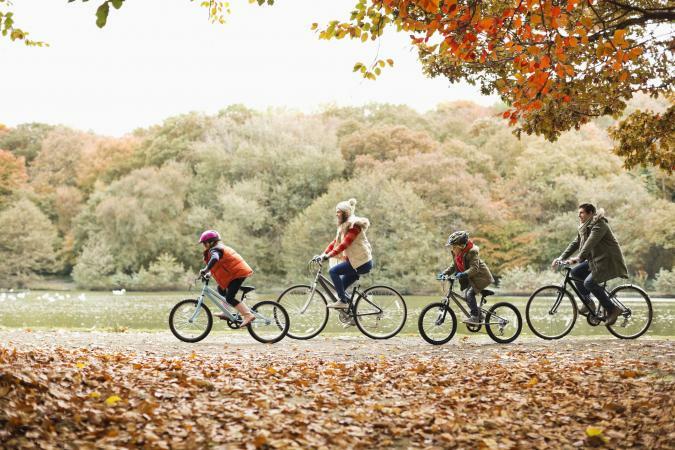 If your child's bike uses backpedaling for braking, they need to reach the pedals with ease. With your child's feet on the pedals, have him move one pedal all the way down so his leg is extended. If your child cannot get to the bottom of the pedal stroke, the bike seat is too tall and needs to be lowered. If your child can easily press down on the pedal until it is at the bottom, but his legs are overly bent and feel uncomfortable, then the seat is too low and needs to be raised. Your child should also be able to put one or both feet down while still remaining in his bike seat. As your child grows, you will need to re-adjust the seat accordingly. Check with your child about his comfort each time he gets on his bike. If your child is riding her bike at night, be sure it is in a well-lit area with little to no traffic. Have your child wear light-reflective clothing or tape. Turn on bike lights and headlights or helmet lights. Accompany your child at night since drivers may not always be paying attention to cyclists. Consider the following quality bike lights. Ascher makes a rechargeable bike light that costs around $17 and is water resistant. 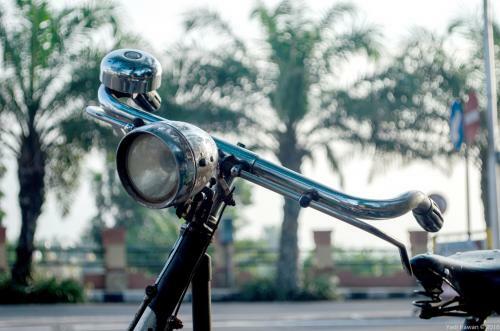 BV Bicycle makes a headlight and taillight that costs around $10 and are weather resistant. Add reflection to your child at night with the following options. Kingso reflective tape costs around $7 and can be worn on clothing or stuck onto your child's bike. Attmu sells a pack of four visibility wristbands that costs around $9. Just like the brakes, the bike chain will endure wear over time. Before your child rides her bike, have her shift gears while walking it. If the bike shifts gears seamlessly and the overall appearance of the chain still looks good, have her get on and test it slowly. If the bike is having trouble shifting gears, getting stuck, or the chain appears to be stretched out and worn, the chain should be replaced. Chains cost around $50 dollars to replace and can be done by a professional or a handy adult. Children need to know basic hand signals when they ride their bike on or near the street. This ensures cars, pedestrians, and other cyclists know where they intend to go, which decreases accidents. A fist behind the back indicates to the cyclists behind you that you are going to stop. Extending your right arm out and pointing to the right indicates a right turn. You can also extend your left arm while bending at the elbow with your hand open and pointing up to indicate a right turn. Extending your left arm and bending at the elbow with an open hand facing down signals a stop. Extending your left arm straight out signals a left turn. Teach your child to be weary of drivers, pedestrians, and other cyclists while they are bike riding. Before heading out with friends or alone, make sure your child knows basic traffic laws. Make sure your child always has a cell phone with them, but make sure they know not to use it while they are riding. It is always safest for your child to be accompanied by an adult while riding his bike. Bike locks help prevent your child's bike from getting stolen or dismantled if left unattended. They are great for older children who may be bike riding with friends, using their bike to get to school, or leaving their bike outside of a store to run errands. Your child can easily carry a bike lock in his or her backpack or bicycle basket, and they are typically lightweight. Bell Catalyst Pocket U-lock costs around $13 and comes with two keys. Amazer Heavy Duty Combination U-lock is key free and allows the user to set a four digit code for locking up their bike. It costs around $27 and weighs just under two pounds. Make sure they are always wearing a properly fitted helmet. Monitor them or make sure another adult is present. Go over safety checks with them before they go out to ride. Go bike riding with them. You will get to keep an eye on them and get in some exercise. When they are old enough to bike ride without supervision, make sure they always have a charged cell phone with them in case of an emergency. Have them bring a bottle of water with them while they are out riding so they stay hydrated, but teach them to stop riding before using it. Consider having your child take a bicycle safety course. Making sure your child knows how to care for their bike and understands basic bike safety puts them at a lower risk for bike related injuries. If you have younger children, be sure to monitor them at all times when they are riding and have older children check in with you if they are out on their own. Preparing your child for safe bike riding is a great way to teach them about responsibility, basic traffic laws, and the importance of exercise.